We do testing for PRA and PRCD on our breeding poodles. 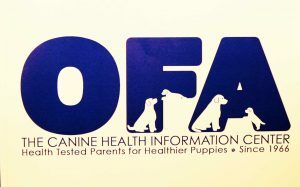 All are normal/clear and certified by OFA. Every effort has been made to produce a puppy that is physically and mentally sound. The puppy will be up to date on all vaccinations, wormings and be free of fleas. The BUYER has the option to take their new puppy to their own veterinarian within 72 hours for a well puppy check. This check-up will be at the BUYER’s expense. 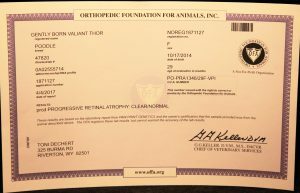 If the veterinarian finds the puppy to have a life threatening illness or a defect that has not been disclosed, the BUYER has the option of returning the puppy immediately to the BREEDER for a replacement puppy. 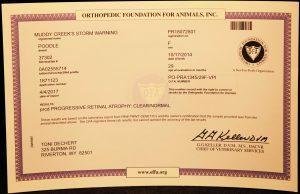 The BREEDER has the right to a second opinion from a veterinarian of their choice. We worm our puppies at two weeks, three weeks, four weeks, six weeks and again before they go to their new homes. The BUYER agrees to continue any vaccinations as recommended by the BREEDER or the BUYER’s veterinarian. The BUYER also agrees to feed a high quality dog food. Until the puppy receives all of the necessary vaccinations (usually around 16 weeks), it is strongly advisable that the puppy not be taken to public places where other pets might be. Also, when you take your puppy to the veterinarian, please DO NOT place your puppy on the floor. We do not want your puppy to pick up any illnesses. They are very susceptible to diseases until they receive their full round of vaccinations. BUYER agrees that this puppy will be housetrained so that he/she will occupy a suitable place inside the home. The puppy must never be chained outside or left unattended outside without a fenced area. I strongly recommend that you crate train your new puppy. It makes the housebreaking process so much easier! A crate will also keep your puppy from getting into things that he should not get into. A crate trained dog makes traveling and visiting much easier also. If a full registration is given, the BUYER certifies that this puppy WILL NOT be used for breeding to any breed other than an AKC or UKC registered poodle. The BUYER understands doing so will void the HEALTH GUARANTEE. Also, if it is found that this dog has been used for doodle breeding of any kind, the BREEDER has the right to demand that this dog be returned to BREEDER with no money refunded. We feel very strongly that a poodle should NEVER be used for mixed breeding! The Limited Registration requirement has been honored (if applicable) and the puppy has been spayed or neutered by one year of age. 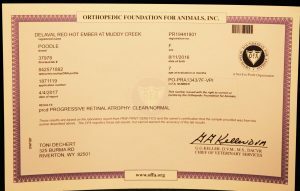 The puppy has not been bred (full registration) until health testing has been completed. (as per the Poodle Club of America guidelines). It is also agreed that this dog shall not be bred to anything other than a health tested AKC or UKC poodle. 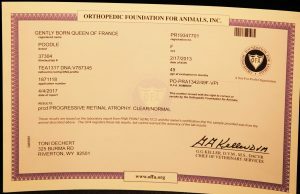 If covered defects do occur, the BUYER has the following options: BUYER may return the afflicted dog along with Veterinary proof of his/her Stated Health or death due to the covered defects and the BREEDER will replace him/her with the same quality puppy (may not be the same color) without charge. 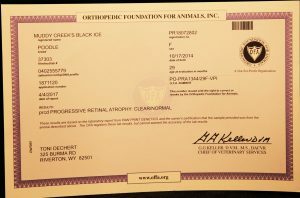 The BREEDER has the option to have the dog evaluated by her own Veterinarian. A new puppy will be supplied as soon as a puppy becomes available. If the BUYER chooses to keep the dog and there will be expensive ongoing veterinarian care that will exceed the cost of the puppy, BREEDER will refund the purchase price of the puppy instead of giving a replacement puppy. The dog must be SPAYED/NEUTERED if BUYER chooses to keep the dog. Puppies change so much as they grow into adulthood. Color, size and conformation cannot be guaranteed. The BUYER also agrees that if the puppy can no longer be kept for any reason, at any age, BREEDER MUST be notified. Under NO CIRCUMSTANCES will the BUYER be allowed to place the dog unless the BREEDER has approved the new home. BUYER also has the option to return the dog to the BREEDER. If we resell the puppy/dog, BUYER will be reimbursed the proceeds less any expenses. We do not want any of our puppies to end up in a bad situation. They deserve the best always. Since we brought them into this world, we feel responsible for them their entire lives. We will always welcome them back into our home! Most of all, please keep in touch and send pictures often. Congratulations on your new poodle puppy and best friend! !